Father-and-son pair Thomas and Kosta Douvikas pose in front at the front of the Oktober Feast tent. D&D Finer Foods held the event to celebrate 45 years of business. In a world where big-name grocery stores like Jewel-Osco, Whole Foods Market and Trader Joe’s dominate the market, a quaint, family-owned Evanston store has withstood the test of time. 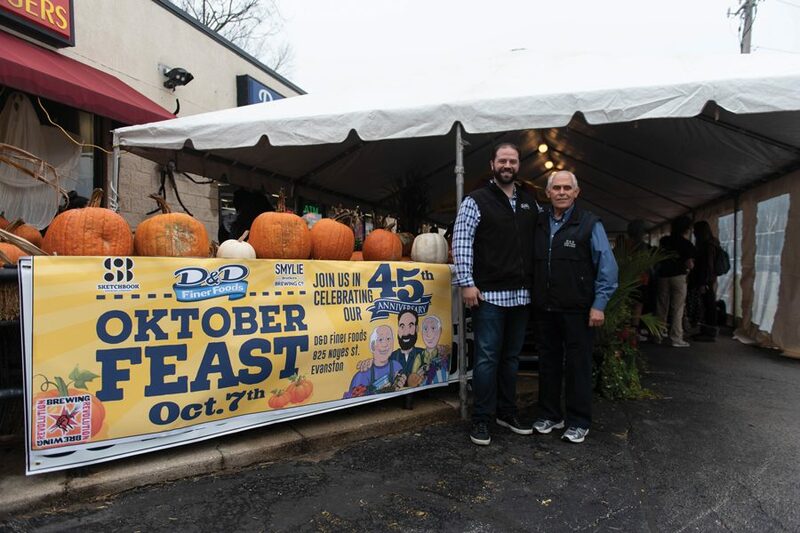 D&D Finer Foods, at 825 Noyes St., celebrated 45 years of operation Sunday with their first annual Oktober Feast. The celebration included balloon making, face painting, free hot dogs and baked goods, as well as a DJ. Local breweries and distilleries, including Sketchbook Brewing Co. and Temperance Beer Co., offered beer and liquor tastings. Owner Thomas Douvikas runs the store with his son, Kosta Douvikas, who said getting to know his customers is at the heart of keeping the business alive. Hospitality is central to D&D’s business, the younger Douvikas said. He makes an effort, he said, to greet every customer and get to know them as they shop. Plopped in the middle of the tented event was a giant pumpkin, which weighs between 600 and 1,000 pounds. Attendees were able to submit guesses for the pumpkin’s weight, and whoever’s guess is the closest to its actual weight will win a $100 gift card. The contest will continue through the end of October, with the winner announced after Halloween. D&D partnered with the YWCA Evanston/North Shore for the event. Verda Bhatti, a violence prevention educator for YWCA, set up a table to educate Oktober Feast patrons on the services and programs the organization offers. The grocery store donated $500 to the YWCA for partnering with them at Oktober Feast, Kosta Douvikas said. Evanston resident Katie Gillies lives down the street from D&D. She and her family always shop at the store, thanks to its convenient location and better quality food, she said. Gillies said the event was “super fun” for her entire family, including her two young sons. “Any time there’s something going on in the community that brings people together is a good thing,” she said. This was the first time D&D hosted an Oktober Feast event, but Kosta Douvikas said he hopes to continue the event in future years. He added that the intent behind the event was to thank customers for their continued support of the store over the past 45 years. His father agrees.